Home | Vinyl Siding Cost | Is siding cost your deal-breaker? Fiber cement has a few advantages over vinyl siding --a more realistic, wood-like appearance, for one thing, no expansion issues after installation for another. So why would you consider vinyl for your home? Often, it's a matter of budget. 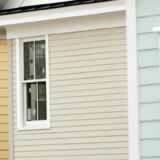 Most types of vinyl siding are less expensive than fiber cement, and installation labor can be less costly, as well. A single, eight-inch, vinyl siding panel in a thick, .048-inch gauge might average about $96 per siding square for the material and $120-$135 per square to install. A ten-inch, vinyl panel in a .048-inch gauge might average about $115 per siding square for the material and $120-$135 per square to install. Double, five-inch-vinyl panels in the same heavy gauge usually average about $92 per square for materials and about $120 per square to install. How does fiber cement siding cost compare to vinyl? According to the same guidebook, you can expect to pay about $145 per square for ten-inch, fiber cement panels that have around eight inches of exposure. Typically, it costs about $151 per square to have them installed. These numbers may not seem like much of a difference when compared to vinyl, but if your home requires 30 squares of siding, the lower vinyl siding cost can add up to better than a $2,000 savings. They're both great products, but if you have a tight budget, vinyl might be your top choice.